A couple weeks ago I was talking to my sister in law about wanting to go. She said we should make plans to go. I kind of scoffed in her face and said I refuse to make any more plans like that because they keep falling through. Then a couple weeks later I mentioned to my husband and said she would go. One thing led to another and they made plans for us to go. Initially, the plans were to go yesterday (Sunday). He then was so excited he told me. I called my MIL to invite her too and realized that I should make sure they are open on Sundays. I could easily see them not open on Sundays. BTW, they aren’t. I mentioned that to hubby and so we changed plans to go on Saturday. Plans were to go down around noon. By the time we got out of here, it was after that. Either way, I saw on the website that the best times to get in and eat were late afternoon and early morning. We got there late afternoon. We had a party of 9 and even at that, we waited about 45 minutes. 2 smaller tables (a 2 top and 4 top) got in before we did that were standing behind us, but otherwise, we got in almost in the order we were all standing there. With the group of us that went, we had 2 littles. So the husband’s stood in line and the rest of us went into the store to have a look around. Guys, the store is awesome. You can get some of her line in her store, but not everything. Maybe there are Walmart exclusives that you can’t get there. I don’t know. I really want the Charlie cookie jar, but haven’t bought it. So I mentioned to hubby if they had it in the store I couldn’t guarantee I wasn’t coming home with it. They didn’t so I didn’t. I did get a Christmas tree ornament. Hey, I love those memories on my tree. My MIL bought me this really cool platter. It looks like a cheapo paper plate, you know the ones with the kind of fluted edges. But it’s Melamine. It has a steer on it. Guys, this thing is so cool! Thank you Memaw!! Then hubby bought me a replacement cookbook, but more on that later. 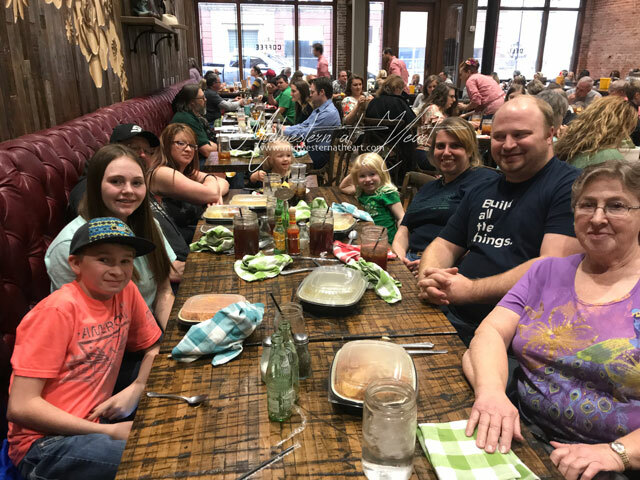 We knew we planned on eating while at The Mercantile, so none of us ate lunch. In fact, we were bragging about what we did eat before we left the house. Chips, cookies, something from a vending machine, etc. Obviously nothing big. So needless to say, when we got seated, we were starving. Okay, okay, I’m far from starving, but we were hungry. Hubby ordered Big, Bad Nachos to start with. 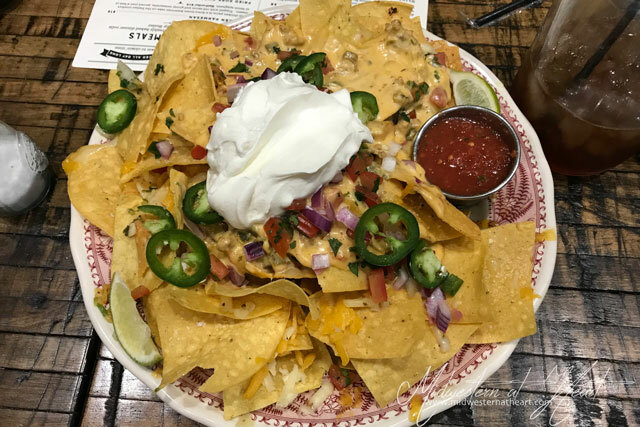 Big Bad Nachos: Topped with your choice of Oklahoma Beef Chili or Spicy Grilled Chicken (we went Chicken), piled high on fresh-fried tortilla chips with Queso, Cheddar, Pepper Jack, Fresh Jalapeño slices, Chopped red onion, Pico de Gallo, Sour Cream, Cilantro Lime Cream, and a side of Ree’s Legendary Salsa. OMG you guys, AMAZING! Wes and hubby said the jalapeños weren’t hot. I think I ate one. I tasted it but they were right. That hint of lime on there was amazing. The fresh-fried chips were amazing. The queso was excellent. But that hint of lime. I’m not sure there was anything left on the plate when our server took it away. Easy clean up for them :). My entree came with a Salad. 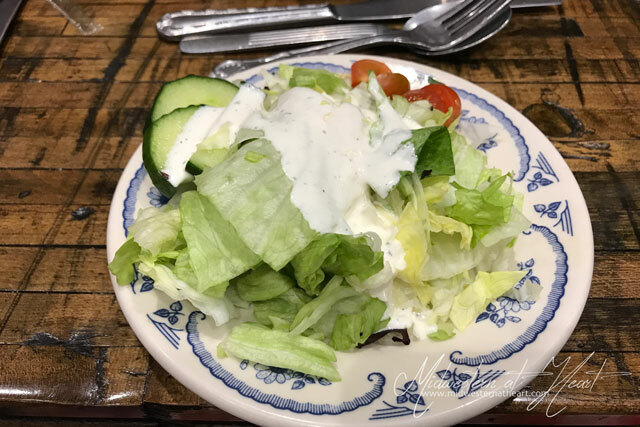 The Ranch dressing was good. Not sure if it is like the one in her original cookbook or not, but yum. 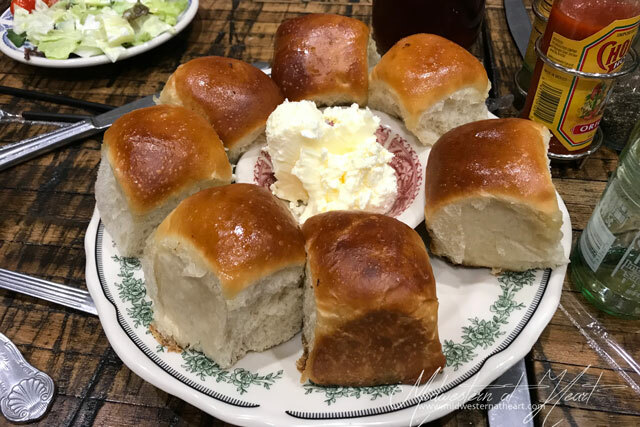 We each got a roll as well. They were good, but nothing just outstanding about them. I was reading through the menu and having a hard time deciding what I wanted. Hubby asked me multiple times and I kept giving him the same answer, one of everything, please. Seriously, where’s the sampler platter? I finally, after so much deliberation and the fact that if I got something different than hubby and Tbug I could try a little of everything, I went with the Chicken Fried Steak. Chicken Fried Steak: This is the Cowboy Dish of your Dreams! 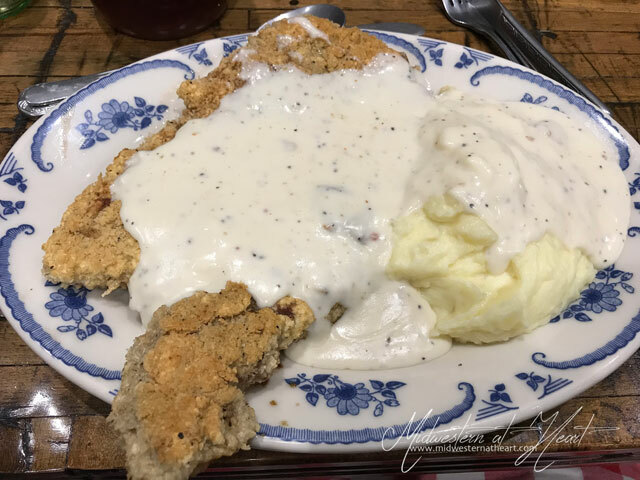 Not your average Chicken Fried Steak, this is real Beef Ribeye, pounded, breaded, and grilled to crispy, tender perfection with a flavor-packed cream gravy and the richest mashed potatoes you’ll find anywhere. OMG, you guys. This was an amazing choice! I went for the full because I figured, hello, leftovers! And there were. I couldn’t eat it all. OMG, I couldn’t eat it all. But yum! The mashed potatoes were really good. They had a unique flavor that was exceptional. Wes thought they could have used a few more lumps, but you could definitely tell they weren’t store bought mashed potatoes or out of a box or anything of the sort. But that chicken fried steak. Yum! Hubby went with the Cowboy Steak Dinner. 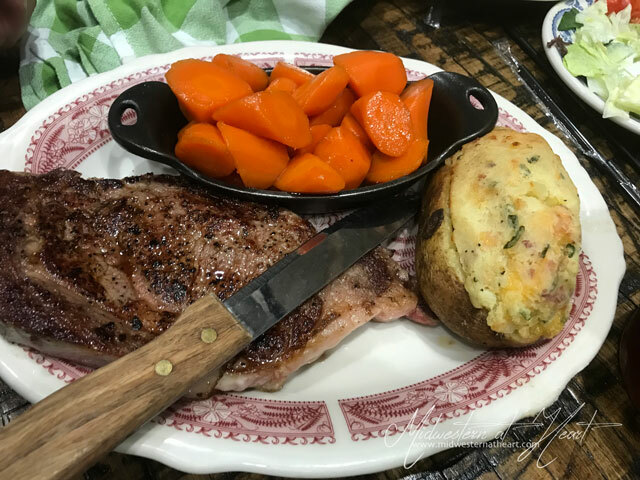 Cowboy Steak Dinner: A perfectly seasoned 12oz USDA Choice Ribeye, cooked to order (he went Rare) and served with a twice baked potato and blistered green beans. Um… if you’re looking at that plate, those are Whiskey Carrots, not blistered green beans. He must have subbed in those carrots? That’s my guess. That steak was cooked perfectly. He usually goes Rare so that he’ll get medium rare by the time it sits, waiting to be delivered. That twice baked potato was a little done in my opinion but very good. The carrots weren’t done enough for him (I like them crisp, he likes them soft) but they were a little strong on the whiskey and not enough glaze. Either way, they were very good. Not as good as my Mashed potatoes, but still good :). No picture but Tbug went with the Chicken Parm. Yum! and Abug went with the French Onion Soup. Yes, my 3 1/2-year-old LOVES French Onion Soup. Now let’s talk about that soup for a minute…Tbug and hubby subbed that in place of their salad. Hello, my favorite French Onion Soup has always been Outback until now. Oh. My. Gosh! This stuff was AMAZING. It takes the cake. Oh and we also had cake but another story for a few minutes from now. That soup though. I did find it in her cookbook and on her website. Hopefully the soup I found there is the exact same recipe because it’s life-changing. I wish I was joking and maybe I am exaggerating just a little… but not that much! Holy Cow! 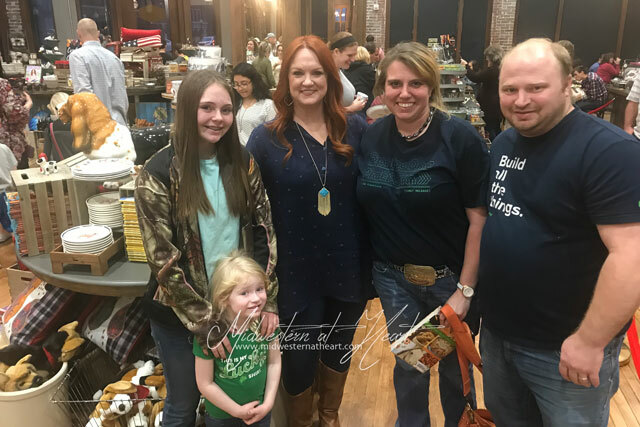 While we were sitting there waiting for our food, PW, her husband, SIL, BIL, and their 2 kiddos, and Chuck came in and sat at the table right next to us. Of course, that was awesome but I tried not to gawk. Come on, they probably want to enjoy a dinner in peace. But still. Now, the funny thing is their food came out before us, but come on… they write the paychecks! Well, my husband started teasing my MIL about waiting on our food and Ladd overheard. He said something and hubby got a smidge embarrassed (although he doesn’t get embarrassed) because he was overheard. Then he saw Ree pick up her phone. Next thing you know she was telling us our food was on its way out and she apologized that it took so long and that theirs came out before ours. Come on, they are the owner. I’ve worked in the food industry before. The owner comes in you move their order to the front of the line, hello! My daughter’s “future in-laws” (haha) are so nice. Our food was right out too. I guess Ree was texting the manager. We ended our dinner with dessert. Chocolate PIe (holy yum), Chocolate Cake (again, holy yum), and Tres Leches Cake (Oh, my gosh! Yum). And since this post is so frigging long, I’ll save the cookbook story for another day. You’re welcome! Thanks for sticking through this long!! Have you been to The Mercantile? What did you think? She’s 13, if I remember right. Maybe 14. I was disappointed, to say the least. Oh, I should add, granddaughter is not a country girl. Her mother’s very liberal, and our oldest son surprised us by becoming more liberal than conservative.